The current state of global deforestation is very alarming. In a data released by the World Resources Institute, the year 2017 was the second worst year recorded as far as tree cover loss is concerned. Despite concerted efforts from various sectors, the number just keep on piling up. However, as they say, all hope is not lost, and as inhabitants of mother earth, we need to continue to do our part and in due time, everything will pay off. In Kenya alone, the forest coverage is at 7.6% below the target level of 10%. We deem it necessary to take this matter seriously. Thus, we at Camp Ohana Village are doing our part by spearheading a year round tree planting project at the Camp Ohana Village. We launched our Sponsor A Tree program this past March. A Journey of a thousand miles begins with one step. Although the level of deforestation is alarming, we are doing our part and ask you our fans, donors and supporters to join us on this journey to plant as many trees as we possibly can and reintroduce many indigenous trees that were once cut down. Imagine what we can do if we all join hands. 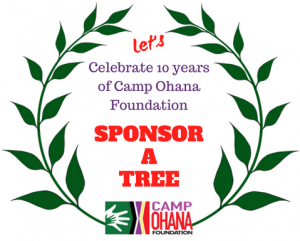 It is time to heed the call, Camp Ohana Foundation is looking for folks to sponsor a tree in support of our tree planting efforts. Every tree you sponsor will be planted in your honor. I look forward us planting as many trees as we possibly can. Click on the link/photo below to sponsor a tree.